"This recipe may take a little work but it taste great. To devein the shrimp use the tip of a sharp knife or a deveiner." To make roux: melt 2 cups butter in saucepan over moderate heat. Add 4 cups flour all at ounce, stirring constantly over low heat, for approximately 5 minutes, until roux is a very pale ivory color. Set aside. Add onion and garlic, cooking until tender, adding more butter if needed. Add paprika, cooking for 10 to 15 minutes. Once paprika is dissolved add tomato paste and mix well. Deglaze pan with brandy; add fish stock and simmer. Thicken soup by adding small amounts of roux, each time mixing thoroughly. Strain soup, pressing shells to extract all liquid. In separate saute pan, saute shrimp in butter and add to soup mixture. Add heated heavy cream, sherry and season to taste using; hot pepper sauce, Worcestershire and seafood seasoning. Stirring well and serve. 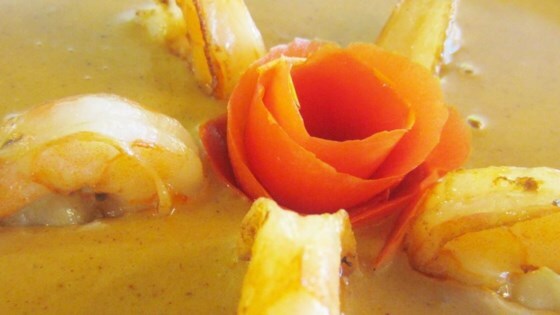 See how to make a quick shrimp bisque with spicy Asian flavors. Sorry but this just did not do it for me. Overpowering brandy/sherry taste and lacking basic seasoning i.e. salt and pepper. Thanks for posting your recipe though. Awesome but very time consuming, made exactly as stated and next time would double the shrimp, not engough. Yummmmmmie. I would have given this a 5, but it is different each time you make it. I have found that using clarified butter is important. Lots of work, but usually worth the effort. I felt that the addition of heavy cream to a already thick roux-based sauce was too much. Additionally the fish stock replaced rather added to the shrimp flavour. I liked the use of Brandy.